If you rename the ASC.DLL in the panel folders shown below to something like ASC.thiscouldbecausingtheproblemsIamhaving (okay ASC.DL! will also do) and insert the version attached to this post and report back. Did anybody try the new ASC? I did not see any feedback to this. Could be the people who tried it got there problems sorted and are now flying byt we still like to know. The sounds are in the plane, every swithc and so on is such a ASC sound. If you gon into a side slip, there are even 9 sounds that are played. As yet, noone else seems to share my particular Discus problem, so this may be useful. After a frustrating weekend trying to make the aircraft function, I believe I've identified the cause. I encountered multiple CTDs - on aerotow with the B, on trying to erect a BM or BT engine, start an engine, operate switches,even simply move my cursor toward Winch X in the addon menu. [i never clicked it] Every time, the error message referred to Winch X.
Clue No. 1: from the beginning, as soon as the Discus appeared on my screen, I heard a motor running. Not an aircraft engine, but what my memory of gliding days identified as probably a winch. Clue No.2: exiting FSX, I noticed that there was a Winch X tag in the taskbar. I'm no expert, but could it be that Winch X ws somehow starting up automatically with FSX? OK, only one obvious solution: I deleted all the many Winch X files scattered through my system. Result: my Discus now functions perfectly. To a one-time Discus pilot, it's wonderfully realistic in handling and sounds and thermal behaviour. I've just flown a 50km xcountry, with with the aid of 10kt default thermals. Great! But I'm not so happy that an expensive aircraft only functions with a key function disabled. As far as I am aware there was no reports of CTD's within the Beta relating to WinchX. The only stipulation with WinchX is that you need a minimum of 20fps. Some systems will do a neat launch on less. On installing WinchX then it adds an entry in exe.dll, if this is the case when you fire up FSX it will load WinchX. Two remodies to this is either 1. delete the entry in exe.dll or 2. on startup just close WinchX if it's not needed. No doubt others will chirp in on this one also, but, I can only inform you as to what I gathered from the Beta. We like to see a few screenshots of the crashed system (so any error message).... as soon as possible please. I've deleted all files from WinchX but the Problem is still there. I have Vista 32bit and the review Copy, maybe this is important. You also have CumulusX running? Is it also contained in the glider? Because i didn't download it. 4) did you changed anything regarding User Account Control (UAC) on your system? No? I got another tip for you. All people with CTDs, please delete CUMULUSX! It CAN be that there is something wrong in communication between the C4 and CumulusX! None of these programs are bad or something. But they work together and one guy found out that he didn't get the CTDs anymore when cumulus is deinstalled. Yes, even if it works with other planes. I've had it, Mathis. Yesterday the wretched thing worked fine after deleting Winch X. Today, hopeless. Starter button = CTD. I've run out of patience with a product which appears to have been prematurely released. I never thought that Aerosoft, of all people, would let me down. I believe I am entitled to a refund, or at the very least a credit note for use when this aircraft grows up. I face the same problem as all the other guys. Entering the cockpit CTD with the default "Flight Simulator funktioniert nicht mehr" Errormessage. And even more funny, like the ones tned to be not believed my simulator also worked real fine yesterday ( I posted the thread with the textures showing through and had no CTD at that time) and today i never get it to work anymore. I too have CumulusX 1.5 installed yesterday after some frustrating non thermal flights. In Kiel-Holtenau i never made it back to the airfield and drowned in the Kieler Förde with no updraft at all. CTD happened every now and then before but not this often and not fixed to the point regarding one special plane or place. I hope you find a solution fast. Well i did one thing: I started the "standardflug" and landed the glider (air creation default FS) plane savely at Friday harbour. Saveed as a new standardflug and started from there. Load Discus aircraft; START winchX and up i go with no CTD. Only problem I face the last two days is i never have ANY upwinds at all. I changed weather from Clear Sky to good weather conditions to download actual weather via Internet...nothing. No updraft in ten flights. All were about 5 minutes long and ended in stranded/crashed plane while landing anywhere in the "pampa". Even CumulusX made no difference! How dio i genereate upwinds in FS? Do i need Active Sky Advanced to creat weather that works? Don't know what to do. This way soaring isn't much fun at all! I do have to admit, i am no r/l sailplane pilot. I never learned to do that. Maybe it's me doing it just wrong in a way. Waiting for an answer, Mario. As you can see, a fraction of people who bought the discus have problems. How can WE know, during developement, that YOU will have a problem? We sorted all things, we knew out, and that VERY well and precise, and you call it "prematurely released". This is cool, especially because you don't seems wanting to work with us, to sort the issue out. I am working all the weekend, and the whole day now, to solve this issue. I am work only, and ONLY on this issue! And even yus, who have NOTHING to do with aerosoft help me. You say, we let you down? You even do not answe to my questions! Again, is CumulusX! installed? Yes or no? If yes, delete, try again, and report! We all can't reproduce the issue. We need YOU to help us, that we can help you! At least it is a problem with your system, not with ours. We ensure, that the plane works on a clean OS, with a clean FS. And it does. We can't ensure more. Please U too, UNINSTALL cumuluss. We must know if it causes a bad reaction with the C4. EDIT. Please deactivate your "b21_vario.dll" for a test, too. It controlles the sound of the C4. You'll have a uncompensated vario then, but this is only a test. As soon as we found the issue we can start solving it. I'm on it. as you see in my last post, i have no CTD anymore when starting from "standardflug" and loading airplane and airport after that. like in old FS2004 days, some planes (like the Digital Aviation Cheyenne) reacted VER VERY sensual on starting them direktly from the opening screen in FS. Bitte, Joachim, lass dich nicht ärgern! Ich kenne diese Leute nur zu gut, die nur zuhause sitzen und meckern, meckern, meckern....aber nichts tun wollen. Haben es mit allen anderen Sachen geschafft, dann auch hier! So, ich UNINSTALLiere erstmal CumulusX. Liebe Grüße aus der Heimat, Mario. I don't think so, because i've got the same issue ad I haven't installed CumulusX. By the way: A friend of me has got the same issue, and he has got Vista 32bit, too. 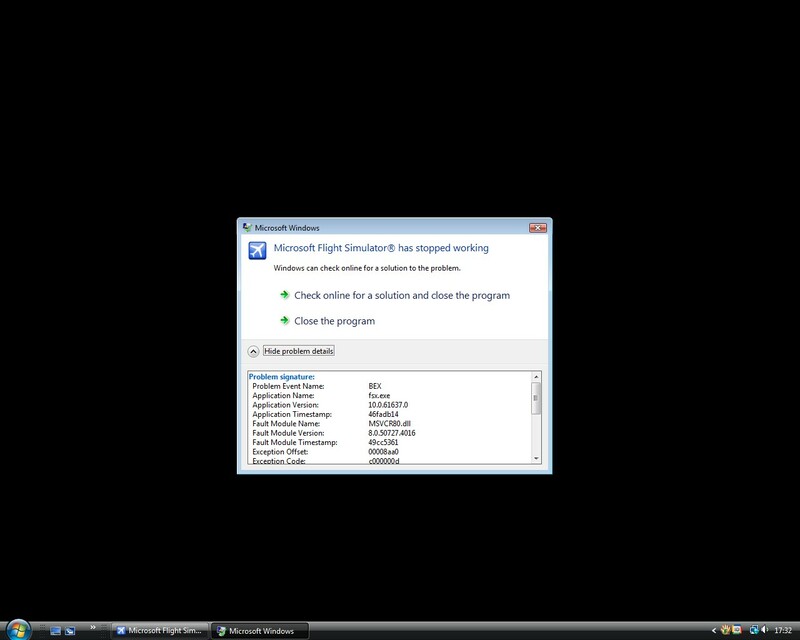 So i think the glider has a problem with all system softwares (Windows XP, too). Ich werde mich jetzt auch hinsetzen und testen und ausprobieren, villeicht finden wir ja eine Lösung. Ich werde versuchen, so gut wie möglich zu helfen, denn der Flieger ist einfach klasse, da habt ihr super Arbeit geleistet! Mal schauen was die Neuinstallation so bringt. Und bitte beschränkt euch beim Suchen des Fehlers nicht auf Vista 64bit, denn ich kenne jetzt schon mehrere Leute (mich eingeschlossen) , bei denen der Glider auf Vista 32 bit und sogar auf XP nicht funktioniert. I've got FSX (Deluxe and Acceleration) on its own drive and I've disabled UAC; I have a primary Administrator account in the OS, which is Vista 64-bit. I'm flying the Discus with both Winch X and Cumulus X 1.5 installed and running...no crashes (yet) and lots of lift when weather conditions and time of day are right. I offer this in the hope that it's useful information...I'm having a blast with this sailplane. I hate to say this, but UNINSTALLING cumulusX didn't change a bit. I also have CTD with starting from "Standardflug" and then changing the airplane/airport, so this didn't solve any, either. So, i will be trying some things tomorrow, as you seem to be off duty now...it's late and everybody needs some "Feierabend"! 20:00 is by far late enough to quit working for the day. Better luck tomorrow and don't let it get to you! Even if it didn't help to solve the issue, it helps us to sort out things. ..ok, sir. i have some hot coffee, let's do some together. I'm thinking of getting this problem fixed by trying a more structured way of testing where it goes wrong. What you could do to help the boys is see if you can repeate the CTD when you do exactly the same as you described before. Same change in airplane/airport same action afterwards. In those situations, do the CTD take place at the same moment every time ? When you can reproduce a same situation where the CTD's appear every time again, we (that is the profi's and us users) can start looking what causes the problem by changing one possible cause at the time and see if the CTD is dissapeared. Well, i did the Tutorial flight #7 with the default sailplane and the termics worked just fine. Getting to Minden-Tahoma in a flight again and all termics were gone. i had to download the weather again and change termic view to schematic to turn them back on. After that i flew several minutes and tried again...no CTD. Sorry, i can't halp you for now. The CTD seems to have resolved itself due to me being more familair with the glider. I was trying to start the engine when it had been stowed and that seemed to be the issue.